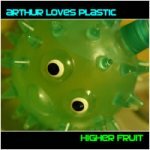 The prolific Bev Stanton has put out her tenth album as Arthur Loves Plastic. As ever she supplies cool grooves and evocative moods. Her frequent collaborator Lisa Moscatiello returns to sing on some of the albums strongest tracks. “Feel the Love” and “Silent Now” are both radio-friendly and should get dancefloors moving. “Sorry” features the soulful vocals of Velvette Simon and is a strong song. “Where You Are” is a remix of a song by Linda Smith and it’s stunning. Moscatiello returns for the closing “In the Here and Now”. “Higher Fruit” is well worth checking out.